Behind the scenes with Dolby Atmos at Ministry of Sound | What Hi-Fi? “This means you don’t need the DJ app in front of you in order to perform,” explains Gabriel. “Some of the feedback we got back originally was that DJs don’t want to use a laptop because it puts a boundary between them and the audience. So you can have the DJ app off to the side to perform your set if you want - everything is mapped automatically to the CDJs. “A lot of the time the bass and the drums will be kept in stereo or mono in the mix, but it’s the other things - the pads, the vocals, the effects, the uplifters, the drops - that are really great when you start to pan them around. After all this talking, it's about time we took to the dancefloor to experience it for ourselves, so Gabriel cues up an Atmos demo track to show us what it can do. "Hello... my name is Atmos"
“Hello boys and girls,” a voice booms. “My name is Atmos”. A drum beat pans all around, and there's the sound of crickets fluttering overhead. A vocal track comes from the back of the room, up and over my head to sit at the front briefly, before it disappears to the back again. 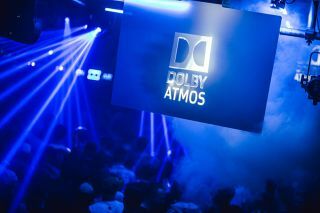 To hear Dolby Atmos in action at Ministry of Sound, head over to the club's event page for more information.